The Little Mermaid on October 20 and 21. This was my favourite movie as a kid. Ursula the Sea Witch was a fantastic villain and has the best song ever, Poor Unfortunate Souls! Who doesn't love to sing along to that wicked little tune? Hercules on October 27 and 28. Hades is the God of the Underworld and the villain in this picture. He is charismatic and a delight. Peter Pan on November 10 and 11. Who doesn't love Captain Hook? The villain of this classic Disney picture from 1953 is one of the most iconic Disney villains ever. 101 Dalmatians and November 3 and 4 has the fur-coat wearing and cigarette smoking villain Cruella de Vil. Cruella has become a pop-culture icon and one of the most recognisable literary and film villains ever since she first appeared in 101 Dalmatians back in 1956. And here's a piece of trivia you might not know: her name is a pun of the words devil and evil! To book your tickets to the Disney Villains Film Festival CLICK HERE. Why? 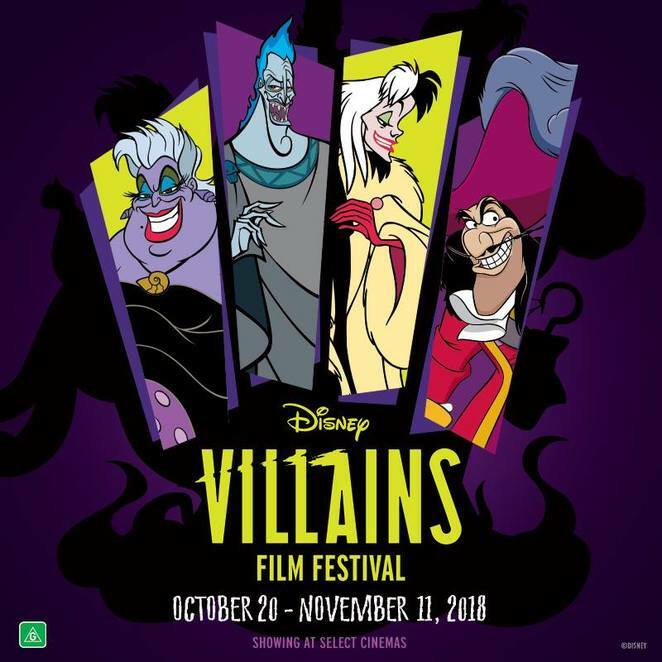 Event Cinemas will be hosting a film festival devoted to nostalgic Disney Villains from October 20 to November 11. Come and see some of your favourite baddies on the big screen. When: The Little Mermaid October 20 and 21, Hercules October 27 and 28, 101 Dalmatians November 3 and 4 and Peter Pan on November 10 and 11.